I am one of a handful of bloggers who are working with Boxtera,a monthly subscription of the best gourmet products found on the market. Customers choose a monthly subscription of 5, 10 or 20 full-size healthy boxtera snack pouches which are delivered directly to their office, dorm or home door. Each boxtera discovery box includes five adventurous all-natural snack varieties that fall into one of the five taste categories included in your gustatory perception; savory, sweet, sour, bitter and salty. You can also find individual snack pouches sold separately by visiting their Market Place. Boxtera sent me one of their monthly subscription boxes of healthy snacks last month and I enjoyed consuming them. The unique blends and flavors are not something you'd find everyday in a grocery store aisle. This month I was able to try five new snack blends. Wholly Wheat Raspberry Bars - A sweet snack with raspberry fig filling, these bars are moist, chewy deliciousness. There's approximately five bars in a pouch. Chili Lime Churrito Mix - This snack blend is made with chili lime churritos, flaxseed corn chips and buffalo pretzels pieces. The pieces are coated with chili lime seasoning. It's a crunchy snack that's well-seasoned. Fa Va Voom! Beans - This snack is made up of legumes that are dried, roasted, and salted. They were my favorite of the five snacks and the taste reminded me of corn nuts, only larger in size. They are crunchy and full of protein. Ridiculously Good Fruit Chips - This snack is comprised of banana, pineapple, honeydew, apple, and star fruit chips. The taste is a combination of sour and sweet. I wasn't a big fan of the honeydew in this mix, but the other pieces were yummy. Chasin' Cheddar Sticks - These sticks have a cheesy cheddar flavor and are crunchy. They're quite yummy and flavorful. Each pouch of boxtera snacks is resealable to keep in freshness. I was pleased with this month's offerings. The snacks taste good and I don't have to feel guilty about unnecessary calories or additives when I'm eating them. 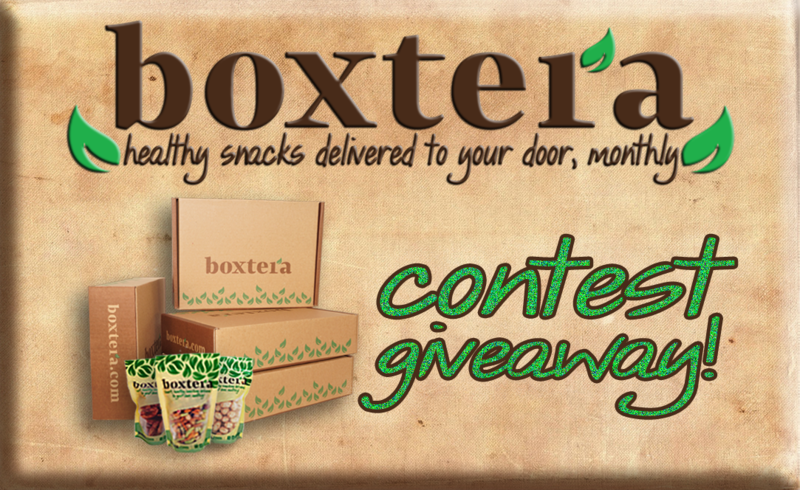 One person will win a box of Boxtera snacks. YUM I love those snacks!